Thank you for your interest in the Hematology/Oncology fellowship program at the University of Missouri-Kansas City School of Medicine. This web site will provide you with general information about our fellowship as you search for the program that best fits your needs. Our training program has a great deal to offer the physician interested in a strong and diverse clinical training experience in the fields of hematology and oncology. Our emphasis has always been on training subspecialist physicians capable of providing high quality care to any patient with cancer or non-malignant conditions of the blood. Our three-year, combined certification program provides training leading to ABIM board eligibility in both hematology and oncology. 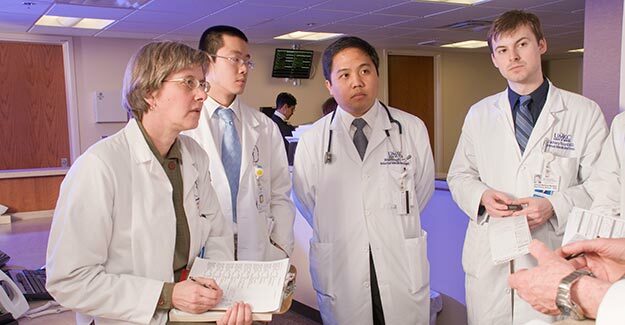 The hematology/oncology fellowship program at the UMKC School of Medicine is based at two of the University’s primary teaching hospitals: Truman Medical Center, the city hospital for Kansas City, Missouri, dedicated to providing high quality health care to all residents of the city and county, regardless of their financial circumstances, and Saint Luke’s Hospital of Kansas City, a large, private hospital with a focus on tertiary, subspecialty care. If your primary interest is in developing your clinical skills as a consulting physician in hematology/oncology, I hope you will seriously consider our training program.